Join in the WELCOME HOME GALA – Central Park – Wednesday August 8 at 1:00p. 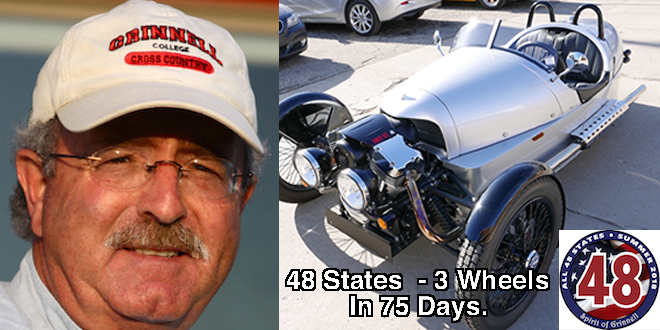 Will Freeman and Morgan 3 Wheeler, dubbed the “Spirit of Grinnell”, will have completed his 48 state, 78 day journey on two lane roads, eating at ma and pa restaurants and opting for local overnight stays. He has set a world trip record for a Morgan 3 Wheel. Meeting hundreds of interesting people and visiting everywhere with Grinnell College alumni Will has an interesting story. Please join in the Welcome Home event.